One thing that video-games do better than any other medium is allow the audience to explore worlds and interact with them in ways that nothing else can replicate. You can’t press a button and watch things appear out of the ground in a movie, for example -- but you could in a video game. Hob is a title that gives you a massive world which your character has the power to change by solving puzzles and skill-upgrades. 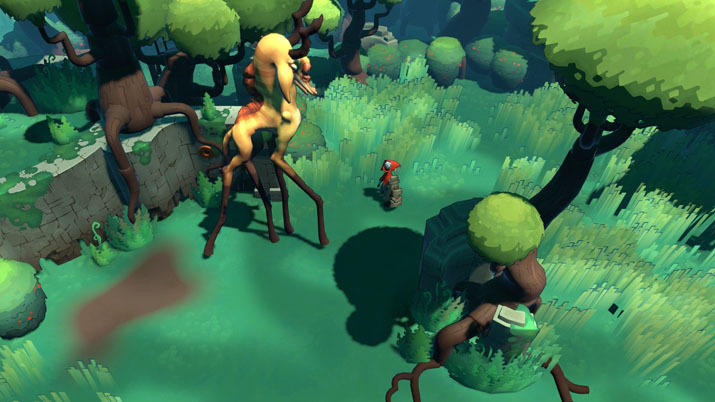 You’ll notice the Legend of Zelda influence right away, but it’s not a big part of the experience; you’re not on a quest to save a princess and fight a bad guy. It’s subtler than that. Writing this review is a little awkward for me because, until a day before the scheduled release, I was playing the beta version of the title, which was, to put it kindly, not optimized that well. My computer isn’t exactly top-of-the-line, but it can run games similar to Hob without any issues. However, with the Hob beta, even on very-low settings, it was still jerky and incapable to even play at twenty frames-per-second. However, that issue has been fixed with the full release. When you go to buy it today [EN: Damn talk about a call to action], you’ll get a well-optimized product that plays on most PCs that meet the graphics requirements. With that issue out of the way, I could finally start to explore what Hob had in store for me. I’m pleased to say it was a lot. A professional painter couldn’t have made a more appealing world if he or she tried. It’s rare for a game to keep my attention for extended periods of time without any distractions getting in the way, but Hob did that for me. It’s a gorgeous landscape, with lush colors that feel like an actual ecosystem, alive with activity all around. The longer I played it, the more fun it became. Some specific things I enjoyed -- controlling large contraptions that change how the world looks in sometimes gigantic ways. The look of the robot creatures that litter the landscape, both alive and dead. They reminded me of the main character in the animated film The Iron Giant. I also enjoyed the way things would light up and start moving after you solved a puzzle, almost as a form of reward for figuring things out. The rewards start small but soon become massive. The controls are solid, for the most part, but you’re much better off using a controller than keyboard and mouse. You can’t rebind the buttons or keys, which might annoy some. However, the setup chosen won’t warrant the need to rebind anything, particularly with a controller. The game’s music takes the subtle approach, and at times you’ll forget that it’s even there. It’s not awful, but it’s not a huge part of the game either. The sound effects, on the other hand, all have a powerful connection to every action you take. If it’s swinging your sword, charging up your fist, falling off a cliff, or pressing the various buttons around the world -- they all sound intuitive. As for the story, it’s hard to say anything about it because it’s almost like one doesn’t exist. Essentially, you’re a small creature who starts the story by having his hand cut off by a helpful robot who does it as an act to save him from death. The robot then gives you his hand, which does all kinds of important things along the way. You set out to explore the world, where your No. 1 priority is to restore the power, indicated by round blue lights you’ll see across the land. After that, you’re taken underground where you encounter more surprises. The run-time is around twelve to fifteen hours, depending on how long it takes for you to discover everything that there is to find. The absence of dialogue is not impactful. Other than getting help when you find yourself unsure how to progress to the next area, my enjoyment of the experience wasn’t harmed by the lack of dialogue, voiced or otherwise. There’s also a few bugs, even in the day-one product. It crashed on me twice in the middle of playing, and I did clip through at least one item that I wasn’t meant to. Those kinds of issues, unfortunately, seem to be somewhat expected in today’s titles. However, it’s worth noting that you’re likely to stumble upon one of them until they hopefully release new updates that address that issue. Runic Games has done a fantastic job making something that studios double or triple their size have failed at multiple times. 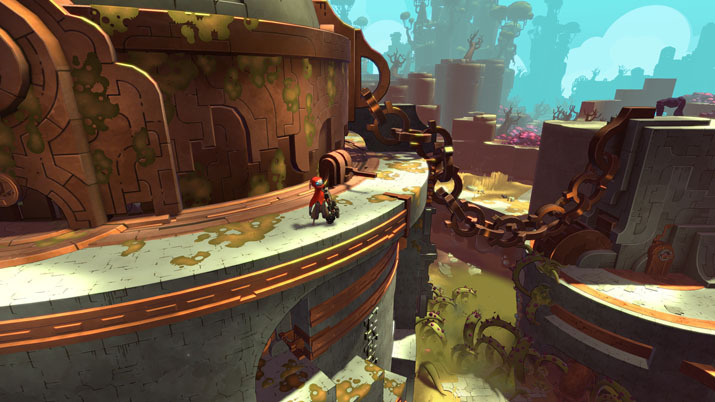 Hob is made for gamers who love to explore, tinker, and problem-solve. Combat is present, but not as a central element. Gameplay consists, by a considerable margin more, of looking for ways to inventively raise, lower, move, open up, or interact with the environment. While, some puzzles are clumsy puzzles, each has a logical solution – though it reaching this point might require a… temporal investment.